Powdery mildew (PM) is a widespread fungal disease of plants in temperate climates, causing significant economic losses in agricultural settings. Specific homologs of the MLO gene family are PM susceptibility factors, as their loss-of function results in durable PM resistance (mlo resistance) in several plant species. The role of MLO susceptibility genes in plant-pathogen interactions is still elusive, however it is known that they are strongly upregulated following PM infection. In this study, we investigated the structure of 414 Putative Promoter Regions (PPRs) of MLO genes and highlighted motif and regulatory element patterns related to genomic relationships among species and phylogenetic distance among homologs. A TC box-like motif and a thymine-rich motif were found to be overrepresented in MLO genes transcriptionally upregulated upon infection with PM fungi. As proof of concept, we showed that the expression of a melon (Cucumis melo L.) gene enriched for the motifs above mentioned was strongly upregulated upon infection with the PM fungus Podosphaera xanthii. 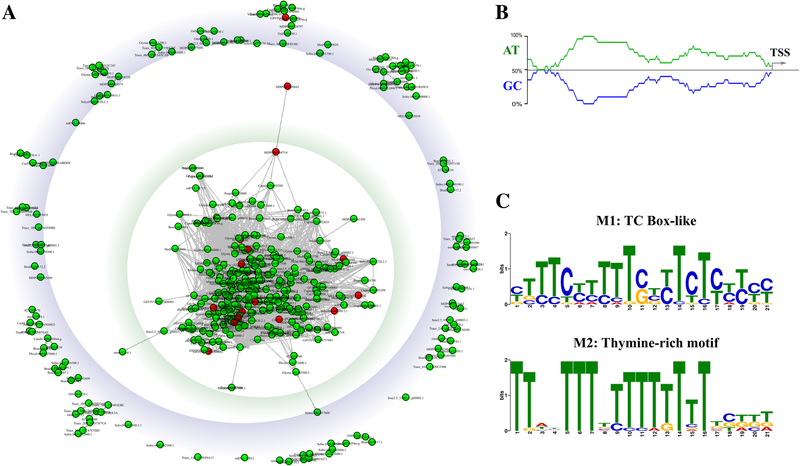 While identifying a candidate MLO susceptibility gene in melon, this study provides insight on the transcriptional control of MLO genes and indicates diagnostic features useful to identify MLO susceptibility genes across species affected by the PM disease. The online version of this article ( https://doi.org/10.1186/s12870-019-1749-3) contains supplementary material, which is available to authorized users. The powdery mildew (PM) disease, caused by ascomycete fungi from the order of Erysiphales, can severely affect the yield and the quality of several agricultural species cultivated in temperate regions, including melon (Cucumis melo L.). Chemical control of PM is generally costly and raises important environmental issues. Therefore, understanding molecular mechanisms underlying genotypic resistance to PM is of great interest for agricultural genetics and breeding. Specific homologs of the Mildew Locus O (MLO) plant-specific gene family are PM susceptibility factors, as their loss-of-function results in a durable and broad-spectrum form of resistance, known as mlo resistance . Originally discovered in barley, mlo resistance was later shown to occur in several other species, namely Arabidopsis, tomato, pea, pepper, tobacco and wheat [2, 3, 4, 5, 6, 7, 8, 9, 10], and proved to be effective against both epiphytic and endophytic PM species [10, 11]. Therefore, several authors suggested the opportunity of a plant breeding strategy based on the identification and inactivation of MLO susceptibility genes [1, 7]. 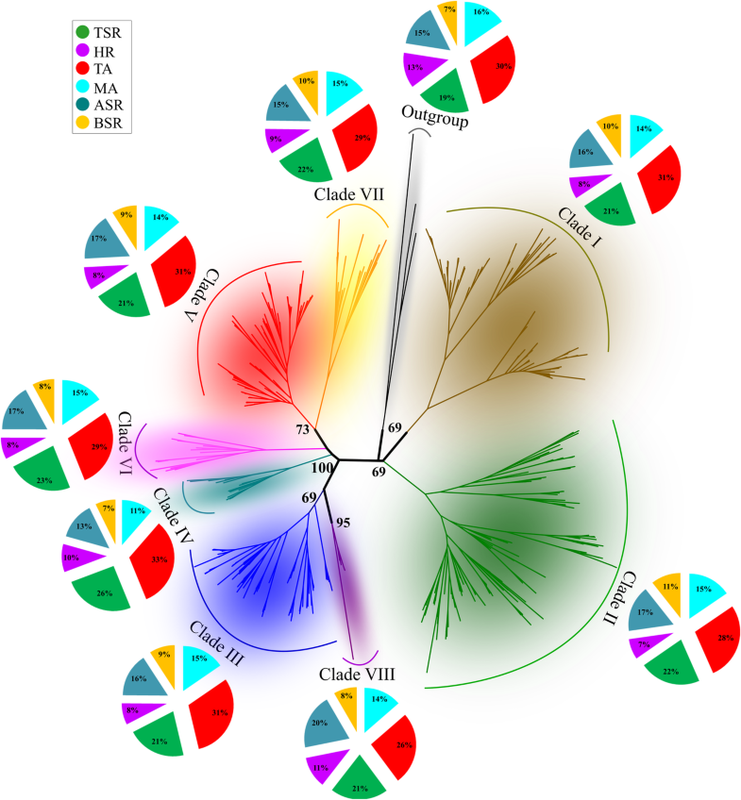 With no exception known so far, MLO susceptibility genes belong to two phylogenetic clades, referred to as clade IV and V, which are specific for monocots and eudicots, respectively [12, 13, 14, 15, 16]. However, not all clade IV and clade V MLO genes are PM susceptibility factors. For example, while silencing of the tomato gene SlMLO1 results in mlo resistance to the powdery mildew pathogen Oidium neolycopersici, silencing of the other clade V genes SlMLO3, SlMLO5 and SlMLO8 is still associated with a susceptible phenotype . Previous investigations showed MLO homologs playing a major role in PM susceptibility, including barley HvMLO, tomato SlMLO1 and pepper CaMLO2, are transcriptionally upregulated a few hours after infection with PM fungi [2, 11, 18]. Transcription is a very important biological process regulated at several stages. Understanding how gene regulation is orchestrated is an important challenge for characterizing complex events such as plant-pathogen interactions [19, 20]. Proteins known as transcription factors (TFs) modulate gene expression in specific ways through their binding to DNA regulatory elements . Therefore, a key aim of gene expression analysis is the identification of transcription factors and DNA regulatory elements. Throughout the last decade, empirical data have accumulated suggesting that mutations in regulatory elements could be a major cause of phenotypic divergence [22, 23]. The term ‘promoter’ is used to designate the genomic sequence located upstream of a gene, which tends to contain cis-acting regulatory elements (CREs). Based on the distance from the transcription start site (TSS), the terms of ‘proximal promoter’ (several hundred nucleotides upstream of the TSS) and ‘distal promoter’ (thousands and more nucleotides upstream of the TSS) are also used. Most CREs are composed of 5–20 nucleotides and are localized in the proximal promoter . It is generally thought that genes having similar expression patterns contain common motifs in their promoter regions . The availability of whole genome data and next generation sequencing technology has opened up new avenues for the analysis of gene regulation and expression. The development of specialized databases of CREs in plants  and the development of bioinformatics tools to discover specific motifs in DNA sequences  greatly facilitate in silico analysis of promoters. Various methodologies can aid the identification of regulatory motifs, including deletion based functional analysis, comparative genomics, analysis of their co-expressed genes, and ChIP-Chip or ChIP-Seq [28, 29, 30] of co-expressed genes for overrepresented motifs [31, 32]. 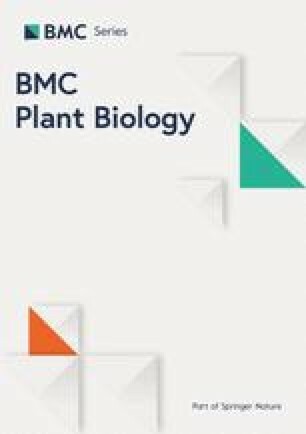 Prior to this study, a unique CRE was associated with the promoter region of the Arabidopsis susceptibility gene AtMLO2 and co-expressed genes, which was found to be responsive to senescence, light stress, wounding and PM inoculation . The aim of our research was to mine motifs and regulatory elements in the Putative Promoter Regions (PPRs) of MLO genes from different plant species, and to identify putative regulatory sequences specific for clade V homologs or for MLO genes known to be readily upregulated upon PM infection. The conclusions drawn by bioinformatics analysis were substantiated by the transcriptional characterization of MLO genes that we have recently described in the genome of melon . Putative Promoter Regions (PPRs), corresponding to the 2 Kbp sequence located upstream the predicted TSS, were successfully extracted from 414 out of 447 MLO genes previously described in 25 plant genomes . To identify CREs putatively involved in the transcriptional regulation of MLO-expression, a search was performed against the PLACE database. Three hundred and sixteen non-redundant CREs, distributed in variable number and order, were detected (Additional file 1: Table S1). In total, 186,060 elements were annotated in the PPRs of our 414 MLO gene dataset, and an average number of 449 CREs in forward- and reverse-complement orientation per homolog was detected (Table 1). Capsicum annum and Arabidopsis thaliana genomes had the highest (476) number of CREs per MLO homolog, whereas the Brachypodium distachyon genome had the lowest number (346). The most abundant CREs were DOFCOREZM (PLACE-ID:S000265), CACTFTPPCA1 (ID:S000449) and CAATBOX1 (ID:S000028), which were recorded 10,983, 10,431 and 8533 times, respectively, in the whole dataset (Additional file 1: Table S1). DOFCOREZM is the core site required for binding of DOF (DNA-binding One zinc Finger) proteins, a family of transcription factors involved in many biological processes in higher plants . The tetranucleotide CACT, present in the CACTFTPPCA1 element, is the key component of mesophyll expression in C4 plants [35, 36]. Generally, flowering plants exhibited a family-specific pattern in terms of number of elements and global density distribution (Fig. 1). Indeed, homogenous CRE profiles were observed for Cucurbitaceae (Cucumis melo and Cucumis sativus), Rosaceae (Malus domestica and Prunus persica), Poaceae (Brachypodium distachyon, Oryza sativa and Sorghum bicolor), Solanaceae (Solanum lycopersicum and Nicotiana tabacum) and Brassicaceae (Arabidopsis thaliana and Capsella rubella). In other cases, the MLO-CRE profile appeared to be family-independent, such as in the case of Brassica rapa and Glycine max. This might be due to to missing information on the CRE sequence of some MLO family members, or the occurrence of true species-specific patterns. Analysis of individual CREs indicated that nineteen CREs were specifically present in monocots or eudicots. As expected, the MLO CRE profile of algae (Volvox carteri and Chlamydomonar reinhardtii) was clearly distinct from the one of flowering plants (Fig. 1), and included 147 elements which might be associated with conserved features during the evolution of green plants and involved in the transcription of MLO homologs. Identified CREs were subdivided in six functional categories: metabolic activity (MA) (63), transcription activity (TA) (74), tissue specific activity (TSA) (45), hormonal response (HR) (60), biotic stress response (BSR) (24) and abiotic stress response (ASR) (50). A phylogenic clade-specific CRE profile was obtained by normalizing, for each clade, the abundance of each CRE class on the total of CREs belonging to the same class [CREsCLADE CLASS/CREsCLASS] (Additional file 1: Table S2). Overall, the distribution of the classes was not markedly different among the eight phylogenetic clades under study (Fig. 2). MA, HR and BSR classes were evenly represented in all phylogenetic clades. A higher percentage of CREs associated with TA was observed in the MLO-PPRs of clade I, III and V (31%) and IV (33%). The highest percentage in CRE related to TSA and ASR was observed in the clades IV (26%) and VIII (20%) (Fig. 2). 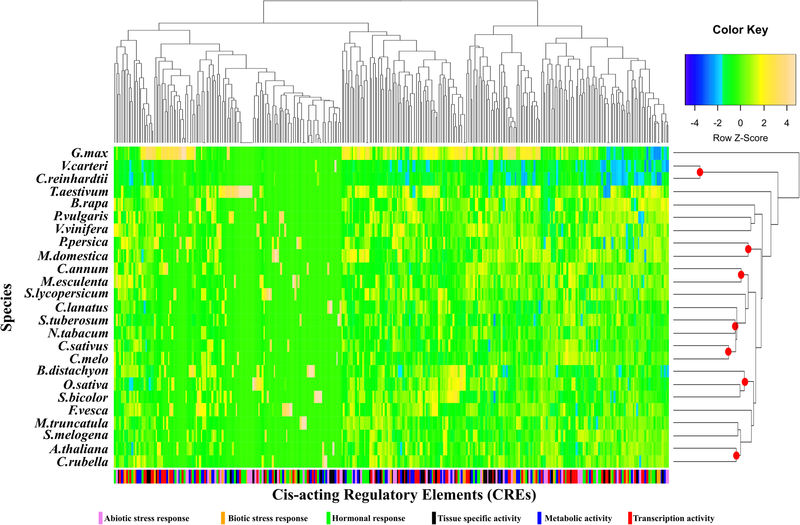 A core of 119 (~ 40% of total) CRE elements was highly conserved in all regulatory profiles of the eight clades. This subset could help to explain the coordinate upregulation of MLO homologs from different clades in response to the same biotic or abiotic stress . Possibly, a core regulatory structure of PPRs of MLOs belonging to different clades promotes a basic gene activation to environmental cues. No specific CRE was identified in either pathogen-responsive or clade V MLO genes (Table 2). In order to identify CREs enriched in specific phylogenetic clades, a motif enrichment analysis was performed. Five clades (I, II, III, IV and V) displayed significantly enriched CREs (e-CREs) (Additional file 1: Table S3). In total, 43 over-represented CREs were identified, of which about 40% were grouped into the TA-class (Additional file 1: Table S3). MLO PPRs clustering in clades I and II displayed enrichment of specific transcription factor binding sites (MYCATRD22 for clade I; RAV1BAT and WBOXNTCHN48 for clade II). Clade III showed five e-CREs (POLASIG1, POLASIG2, GT1GMSCAM4, TATABOX5 and MARTBOX). The element AGCBOXNPGLB, associated with stress signal-response factors (as ER and PR-proteins), was the only CRE significantly enriched in clade IV. Interestingly, more than 50% (24 out of 43) of identified e-CREs, mostly related to the TA class, were associated with PPRs of MLO homologs clustering in clade V (adjusted p-value < 0.01). Additional regulatory motifs in PPRs of transcriptionally responsive MLO-homologs were disclosed. From a first global alignment of the PPR-dataset, the highest sequence identity was observed in the first 200 bp upstream of the predicted TSS. A similarity matrix restricted to this region highlighted the occurrence of a large cluster containing about 65% of the PPRs, including those of 17 (out of 18) MLO genes known to be upregulated upon PM infection (Table 2 and Fig. 3a). Multiple alignment of the same region revealed higher sequence identity (33%) and AT-content (70%) in the PPR of MLO homologs upregulated upon PM infection compared to the rest of the dataset (27 and 64%, respectively) (Fig. 3a and b). Interestingly, a significant association between expression and the AT-content of PPRs was previously reported for genes different from MLOs . A MEME D-mode analysis was carried out to identify enriched motifs in the PPR of MLO genes upregulated during the interaction with PM fungi or included in clade V (Table 2). Notably, two overrepresented motifs (M1 and M2) were found in MLO genes up-regulated upon PM infection (Additional file 1: Table S4). Except for AtMLO3, these motifs were present within the 0.4 Kbp sequence upstream the predicted TSS. Three conserved motifs (M3, M4 and M5) were over-represented in clade V homologs (Additional file 1: Table S4). The consensus sequence of M1 (Fig. 3c) is similar to a TC-element sequence. Previous studies suggested that TC-elements might constitute a novel class of regulatory sequences participating to the complex modulation of expression of plant genes expressed in specific conditions . The highly conserved (~ 70% identity) M2 motif is characterised by a high content of thymine residues. The thymine-rich motif was reported as an essential element for transcription efficiency, since it may serve to increase the accessibility of downstream promoter sequences for additional protein factors [40, 41]. The high variability of the remaining M3, M4 and M5 sequences in the PPR-dataset complicates the prediction of their putative role. Based on Genome Ontology (GO) association analysis, the motifs from M1 to M5 were predicted to be associated with trans-membrane transport (GO:0005886 and GO:0006813), positive regulation of transcription (GO:0016563) and transcription factor activity (GO:0045449, GO:0003700 and GO:0045941). The motif M2 is associated with the GO:0001950 term of S. cerevisiae promoter regions of genes encoding proteins of plasma membrane enriched fraction. Overall, these results are in accordance with the transmembrane localization of MLO proteins and their supposed role in transmembrane transport . The PPRs of 414 MLO genes were also analysed by MAST to verify the occurrence of the CRE motif previously characterized by Humphry et al. (2010)  in the Arabidopsis susceptibility gene AtMLO2 and co-expressed genes. Remarkably, this motif was found in about 96% (408) of MLO promoters. Experiments evaluating the expression pattern of the β-glucuronidase (GUS) reporter gene driven by this motif highlighted strong signal in several organs and in response not only to PM inoculation, but also to senescence, light stress and wounding . Together, these results suggest that this motif might represent a general signature of MLO genes, regulating expression in response to homeostasis perturbations. In silico analyses highlighted the overrepresentation of two putative PPR regulatory elements, namely a TC box-like and a thymine-rich motif, in MLO homologs up-regulated upon PM infection. As proof of concept, we analysed the transcriptional response of three clade V genes previously found in the genome of melon  (MELO3C005044: CmMLO3, MELO3C012438: CmMLO5 and MELO3C025761: CmMLO12). Among them, MELO3C012438 shows the best combined match (combined p-value <1e-5) for the over-represented motifs in the PPR region. 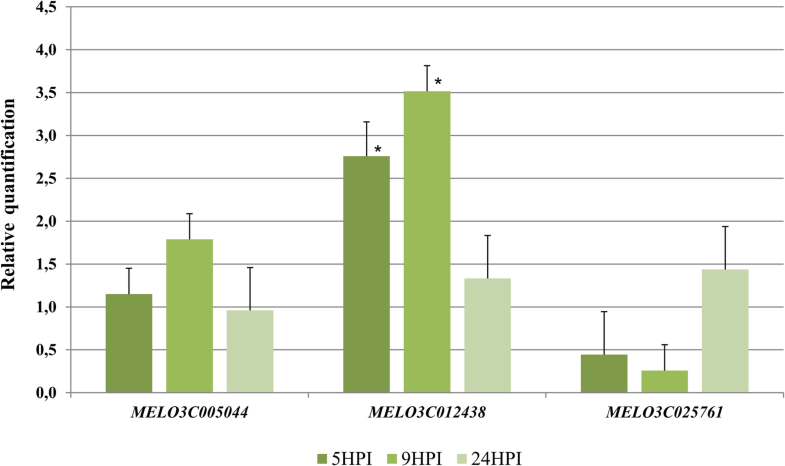 Following artificial inoculation with the PM fungus Podosphaera xanthii, a strong upregulation of MELO3C012438 was observed at both 5 and 9 h post-inoculation. In contrast, no significant difference was detected for MELO3C005044, and MELO3C025761 (Fig. 4). As eudicot MLO susceptibility genes belong to clade V and are upregulated upon PM challenge [2, 11, 18], our results indicate that MELO3C012438 is a PM susceptibility factor in melon. Mechanisms controlling the expression of MLO homologs are not clear. Here we report the characterization of MLO PPRs in a large dataset extracted from 25 plant and algal species. Distribution patterns of putative MLO regulatory elements varied according to genomic relatedness among species and phylogenetic distance among homologs. Two motifs, referred to as M1 and M2, were overrepresented in the PPRs of clade V MLO genes upregulated upon PM infection, which are known to act as PM susceptibility genes. In accordance with this finding, we showed that, in melon, a clade V MLO gene enriched for M1 and M2 is upregulated following challenge with the melon PM fungus Podosphaera xanthii. Overall, this study provides insight on the PPR of the MLO gene family, reports the characterization of a candidate MLO susceptibility gene in melon, and highlights PPR diagnostic features that could be used to identify MLO susceptibility genes across cultivated species. This information is extremely valuable for breeding purposes, as the inactivation of MLO susceptibility genes, for example by targeted silencing and genome editing, might lead to the identification of PM resistant genotypes. 447 MLO genes from twenty-five different genomes (Volvox carteri, Chlamydomonas reinhardtii, Arabidopsis thaliana, Brassica rapa, Capsella rubella, Citrullus lanatus, Cucumis melo, Cucumis. sativus, Manihot esculenta, Glycine max, Medicago truncatula, Phaseolus vulgaris, Brachypodium distachyon, Oryza sativa, Sorghum bicolor, Triticum aestivum, Fragaria vesca, Malus domestica, Prunus persica, Solanum lycopersicum, Nicotiana tabacum, Capsicum annuum, Solanum melongena, Solanum tuberosum and Vitis vinifera), described in the work of Iovieno et al. (2016), were considered as initial dataset. Putative promoter regions (PPRs) (2 Kbp upstream the predicted TSS reported in gene annotations) were extracted using BEDTools v2.17.0 (http://samtools.sourceforge.net) and 414 PPRs (out of 447) with a PPR length > 1 Kbp were used further. PPR-sequences were scanned in forward and reverse complement orientation to search for cis-acting regulatory elements (CREs) present in the Plant cis-acting regulatory DNA elements (PLACE) database (https://sogo.dna.affrc.go.jp/cgi-bin/sogo.cgi?lang=en&pj=640&action=page&page=newplace) . The most stringent identification criterion (exact match) was used. The Needleman-Wunsch algorithm (default setting) was used to generate a non-redundant dataset by eliminating duplicated motifs defined by ‘identical sequences’. In order to obtain a CRE map of Viridiplantae MLO homologs, a hierarchical clustering analysis of annotated CREs was performed. A heat map was generated starting from a CRE-abundance matrix using the ‘GPLOTS’ R software package . Abiotic stress response (ASR): induced by abiotic stresses. A clade-specific CRE profile was obtained by normalizing, for each clade, the abundance of each CRE class on the total of CREs belonging to the same class [CREsCLADE CLASS/ CREsCLASS]. In order to identify CREs overrepresented in specific clades, PPRs associated with each clade were compared to those of the remaining dataset, using the Analysis of Motif Enrichment (AME) tool available in the MEME suite and the default cut-off value . Motif enrichment significance was assessed using the Ranksum test, also known as the Mann-Whitney U test, with subsequent multiple testing correction applied to the obtained P values (adjusted p-value < 0.05). Analysis of motif enrichment and individual CRE annotation were also carried out to compare PPR of homologs upregulated during PM infection or included in clade V with those of other MLO homologs. MAFFT version v6.814b was used to align the first 200 bp of PPRs, and to generate a similarity matrix, using the EINS-i algorithm . A weighted correlation network analysis was carried out using the ‘WGCNA’ R software package . The Multiple EM for Motif Elicitation (MEME) algorithm  was used to identify motifs that are specifically enriched in the PPRs of MLO genes included in clade V or previously shown to be upregulated upon PM challenge (Table 2). The analysis was carried out in discriminative-mode (D-mode), using the default cut-off value for statistical confidence. The best combined match of enriched motifs identified by MEME analysis was detected using Motif Alignment & Search Tool (MAST) (default cut-off: p-value 1e-4 and E-value < 10) . MAST was also used to confirm the presence of the motif previously described by Humphry et al. (2010)  in the PPR dataset, using two different settings (p-value <1e-4 and p-value <1e-3). Enriched motifs were analysed using the Gene Ontology for Motifs (GOMo, http://meme-suite.org) tool  to determine if any motif was significantly associated with genes linked to one or more Genome Ontology (GO) terms . Plants of Cucumis melo (cv. Tendral Verde TS258) were inoculated with the PM fungus Podosphaera xantii by brushing heavily infected leaves collected in the field. Plants brushed with healthy leaves were used as experimental controls. Leaf samples were collected at 5, 9 and 24 h after inoculation (three biological replicates for each treatment and three technical replicates). Protocols for RNA isolation, cDNA preparation and qRT-PCR were the same as those reported by Iovieno et al. (2015) . Relative transcript abundance of the three clade V melon genes MELO3C005044, MELO3C012438 and MELO3C025761 was assessed using the 2−ΔΔCt method , using the β-actin gene as housekeeping for target gene normalization . The Student’s t-test was used to test the null hypothesis. All the primer pairs used for gene expression analysis are listed in Additional file 1: Table S5. For each primer pair, a dissociation kinetics analysis was performed to ensure the specificity of the amplification product and amplification efficiency was assessed by generating a standard curve with five serial 10-fold dilutions. We are grateful to Prof. Luigi Frusciante for valuable discussions on conducted analysis. Financial support for this work was provided by the Italian Ministry of University and Research (GenHort Project). All the supporting data are included within the article. The Supplementary Material (Additional file 1: Tables S1, S2, S3, S4 and S5) for this article can be found online at: (https://figshare.com/s/6adb5ce53cd02838ffbd). Users can download and use the data freely for research purpose only with acknowledgment to us and quoting this paper as reference to the data. GA conceived the idea of study and was centrally involved in bioinformatic analysis, plant inoculation, results interpretation and manuscript writing. PI was involved in data analysis, plant inoculation and qRT-PCR experiments. LR and CL critically revised the manuscript. EF provided a critical reading of the manuscript. SP was involved in experimental planning, results interpretation and manuscript writing. MRE coordinated the project and contributed to results interpretation and manuscript writing. All of the authors read and approved the final manuscript. Not applicable. This manuscript does not report on or involve the use of any animal or human data or tissue. Fujimura T, Sato S, Tajima T, Arai M. Powdery mildew resistance in the Japanese domestic tobacco cultivar Kokubu is associated with aberrant splicing of MLO orthologues. Plant Pathol. 2016;(8):1358–65. https://doi.org/10.1111/ppa.12498. Sanseverino W, Ercolano MR. In silico approach to predict candidate R proteins and to define their domain architecture. BMC Res Notes. 2012;5(1):–11. https://doi.org/10.1186/1756-0500-5-678. Langfelder P, Horvath S. WGCNA: an R package for weighted correlation network analysis. BMC Bioinformatics. 2008;9(1):–13. https://doi.org/10.1186/1471-2105-9-559.